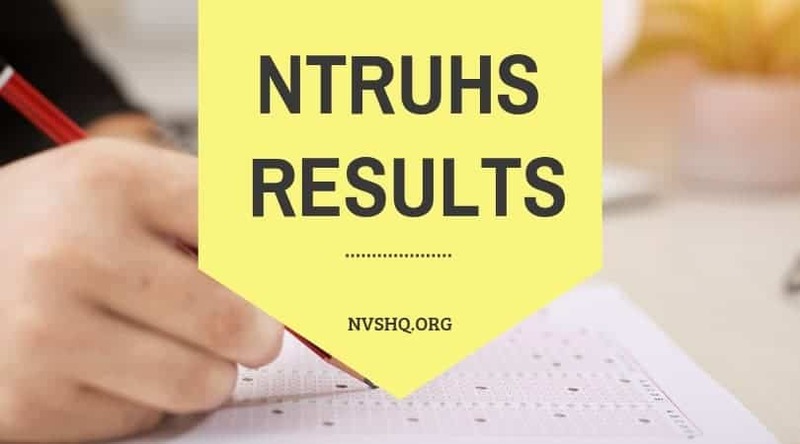 NTRUHS results 2019: Dr. NTR University of Health Sciences (NTRUHS) has announced the result for its various programs like BDS BPT BSC MBBS MDS Results for semester wise result. NTRUHS University has conducted its semester exam from the month of October to December 2018 and NTRUHS result for all these exams are releasing. Now university has started uploading the Dr. NTR result on its official website and examinees who were eagerly waiting for the release of result can access it by using the login details. 2 How to Download NTRUHS Result? NTRUHS students will find important information about Dr. NTR university result in this article. NTRUHS has uploaded the marks and results separately, candidates can access their result directly by using their hall ticket no by they access the result sheet they do not need any login credential. They just have to click on the result link and result PDF will appear. The Online published marks sheet includes name of the university student, college name, course/programs, semester/year, hall ticket no., date of exam, category, marks of the candidate in each subject, practical marks (if applicable), theory marks, total marks, marks percentage, result status etc. Whereas provisional result PDF includes roll numbers of the successful candidates. List of roll number of qualified students is generally released subject-wise and rank-wise (first class, second class etc.). Along with this, it also includes information about re-totaling of marks. Below we have shared direct result link for some programs which are currently active on the official website. Candidates who have not checked their result can on the direct links shared below to check the result for various programs offered by the university. How to Download NTRUHS Result? Candidates have to start by visiting the official website i.e. http://ntruhs.ap.nic.in. On the homepage of the university website, students have to click on the “Result” link to access the result. Search the relevant result option. List of result links of all various subjects will appear on the screen. Students have to select the result or marks link provided in the front of respective course and semester/year. If students want to see result, he/she just have to select “Result” link and result will appear on the screen. In case students want to view their marks then they have to select “Marks” option. A login page will appear and students have to enter hall ticket no. in the space provided and have to click on submit button. Marks of the candidates will be displayed. Lastly, if candidates wish, they can download and take a printout of the result sheet and provisional marks card for their personal record and reference in future. The result published online is provisional and university advised student to not treat online mark sheet as original mark list. The result published in provisional as after the declaration of result, university gives a chance to its students for re-totaling of marks. Students those who feel that they have not obtained desired marks can apply for re-totaling of marks. Candidates not satisfied with their marks have to fill an application form and have to submit it before the due date. University will evaluate answer sheets as per the applications and will publish a revised result. This result will final and no request in this regard will be accepted under any circumstances. All the information related to re-totaling of marks will be updated on official website for the convenience of students. Candidates are also given an opportunity for personal identification of the answer scripts. It is applicable only to the theory answer sheets. Interested candidates have to apply within the stipulated dates with the payment of requisite fee. University will not accept any late application under any circumstance. Information regarding personal identification will be published with revised result and no separate intimation will be sent to any student to attend it. After the publication of revised result and personal identification, university will issue original marksheets to all the successful candidates. They have to collect their mark sheets from the respective college in which they are enrolled. For any help related to result or mark sheet, they can contact concerned department of the college or university. Result for various programs is currently available on official website of university. Examinees can check result before university removes it from website. Students can refer their hall ticket to access the result. If you come across any problem while checking Dr. NTR university result 2019, you can simply ask us in the comment below. Our team will help in solving NTRUHS result query. How to apply for retotaling? How to get the application form? Whn are the retotalling marks of final year part 1 Results to be announced the time limit of 15 days or one month ? I have request to release results of retotalling early ;(i.e within month after applyingfor retotaling)not 10days before supply exams..
Sir,when second mbbs results are released? It will be announced soon. Please stay in touch. sir , when can we expect Final MBBS results ?